It’s a devastating reality that thousands of Australians don’t have anywhere to sleep tonight. The latest census recorded a 14 per cent increase in the number of people experiencing homelessness over the past five years. For people experiencing homelessness, finding the services and support they need is a daily struggle. 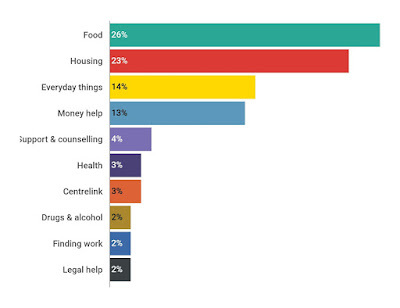 In 2016, we launched Ask Izzy – the mobile site developed at Infoxchange in partnership with Google.org, realestate.com.au and News Corp Australia that connects people in need with services such as housing, food, support and counselling and more. In the last 12 months there have been more than 680,000 searches for help on Ask Izzy, and more than 1 million since the site was launched by Prime Minister, Malcolm Turnbull in 2016. Most of these searches are for food and housing. The average daily demand for food-related services on Ask Izzy has tripled over the past year, reflecting cost of living pressures on Australians as they struggle to feed themselves and their family. These searches on Ask Izzy provide an unprecedented view of the demand for services across Australia. We want to use this data to help inform service delivery and decision making - that’s why we’ve developed the new Ask Izzy Open Data Platform, with support from Google, to make this information available to policymakers and service providers. Using data from Ask Izzy, the Australian Institute of Health and Welfare and the Australian Bureau of Statistics, the platform will be able to show us exactly where and what the demand is for services such as housing, food, health and more across Australia. The Ask Izzy Open Data Platform is currently in the beta testing phase and will be available more widely later this month. If service providers and policymakers can see exactly what help people need, and where they need it, they can better plan and make decisions around how homelessness and support services are delivered. We hope this will help people who are struggling throughout Australia to get better support to meet their needs. The Ask Izzy Open Data Platform will be available later this month – if you’re interested in finding out more or seeing a preview, please get in touch. We know that almost 80 percent of people who are homeless own a smartphone but often they don’t have anywhere to charge it. Find out how you can help solve this problem and learn more about Ask Izzy here.